Russian Foreign Minister Sergey Lavrov said Friday that the United States inquired about Moscow's positions in Syria prior to last week's U.S. and allied airstrikes and avoided those areas. Lavrov said that despite rising tensions between Moscow and Washington, the U.S. ensured that Russian personnel and positions were not targeted during attacks against the regime of Syrian President Bashar al-Assad after suspected chemical attacks on the town of Douma. "We told them where our red lines were, including the geographical red lines," Lavrov said in an interview with Russian state television. At a joint news conference in Moscow on Friday with U.N. Syria envoy Staffan de Mistura, Lavrov said the airstrikes by the U.S., Britain and France "bombed not only imaginary chemical facilities in Syria, they also bombed the talks in Geneva." U.S. Defense Secretary Jim Mattis, meanwhile, warned Assad on Friday that he would be "ill-advised to ignore the international community" by continuing to develop and use chemical weapons, a war crime that is prohibited by international law. "There's been full support for that regrettable but necessary attack on his research and engineering part of his weapons program," Mattis added. 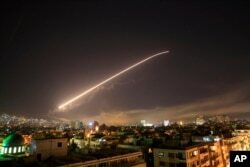 FILE - The Damascus sky lights up as the U.S. launches an attack on Syria targeting different parts of the capital, April 14, 2018. Pentagon spokeswoman Dana White said Thursday that there had been no indication the Syrian military was ready to launch another chemical weapons attack but that Washington and its allies "remain vigilant." The U.S.-led strikes came in response to a suspected chemical weapons attack that killed at least 40 civilians in Douma on April 7. The U.S. blamed Syria. But Damascus and its Russian allies deny any such weapons were used. White said following the recent missile strikes, "Russia immediately began a misinformation campaign to sow doubt and confusion to hide its complicity. Russia falsely claimed Syria air defense shot down a significant number of missiles, when in fact all of our missiles hit their targets." Joint Staff Director Lieutenant General Kenneth McKenzie said Thursday that U.S. military officials believed there was probably some chlorine and some sarin at all of three Syrian chemical weapons facilities targeted in last Saturday's missile strikes. But he admitted that without direct access, "that will likely be an open question." In Syria, global chemical weapons inspectors are still waiting to enter Douma.